Going into The Fifth Estate, an account of the work of Julian Assange and WikiLeaks, I wondered whether I’d learn anything new. We’ve already had a daunting stream of newspaper accounts about the landmark 2010 publication of U.S. State Department cables, as well as director Alex Gibney’s documentary, We Steal Secrets: The Story of WikiLeaks. Could anything be left in a story that already has dribbled much of its juice down a graying, over-exposed chin. Let’s begin at the center — or, rather, at what should have been the center of a movie that’s more confusing than illuminating. British actor Benedict Cumberbatch not only dyes his hair white, but captures much of the elusive charisma that allowed Assange to focus his efforts on lifting heretofore impenetrable veils of government and personal secrecy. Cumberbatch makes for a near-ghostly presence in the film, a man on a mission who regards just about everything else in the known universe as too trivial for his keen attention. Cumberbatch’s performance could have been the centerpiece of a compelling story about an avid crusader who tried to use technology to bring protest into the 21st century, but who was not without egotistical pitfalls. Unfortunately, Cumberbatch’s work is largely wasted by director Bill Condon (Gods and Monsters, Kinsey, Dreamgirls and a couple of Twilight movies). Condon tries to spice up a badly fragmented narrative with graphics that presumably are intended to bring the digital age to life. The tricks include a semi-surreal depiction of Assange’s workspace, one of many quasi-outre touches in a movie that badly needed to plant its feet on firmer ground. It’s possible that the best part of this hyperbolic but hollow film arrives in the form of opening credits that offer an incisive summary of how media has evolved from the industrially rooted print model to the digitally driven world of the Internet. Not content with this fine overture, Condon keeps piling on the visual gimmickry. Witness the frenzied editing or the overlays of printed messages that show us what characters are typing on their laptops. Any screenwriter tackling this kind of complex material faces a major problem: how to give a human center to a story built around technology and ethical and political issues. Screenwriter Josh Singer addresses the issue by focusing on the relationship between Assange and his Berlin-based cohort Daniel Domscheit-Berg (Daniel Bruhl). Currently on view as Formula One driver Niki Lauda in director Ron Howard’s Rush, Bruhl’s intensity holds us at arm’s length, and you needn’t know much about the real story to guess that Berg’s devotion to Assange eventually will sour. Besides, Assange is by far the more interesting character. Condon doesn’t do much with the movie’s supporting cast, most of whom seem like cast-offs from a different movie. Laura Linney and Stanley Tucci appear as State Department workers. David Thewlis and Peter Capaldi play editors at The Guardian, one of the newspapers that published WikiLeaks massive 2010 revelations. I left the movie without being forced to rethink anything about Assange. And for all the movie’s fancy visual footwork, I had no better handle on issues raised by hacking, whistle-blowing and governmental secrecy. 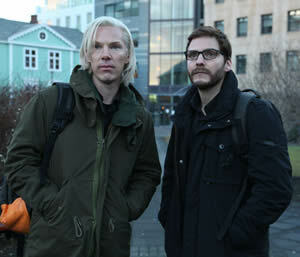 Mostly, I was tired of sorting through the barrage of narrative bric-a-brac that The Fifth Estate, keeps throwing at the screen — perhaps because it doesn’t quite know what it wants to say about Assange or about the practical and ethical issues his activities raised.